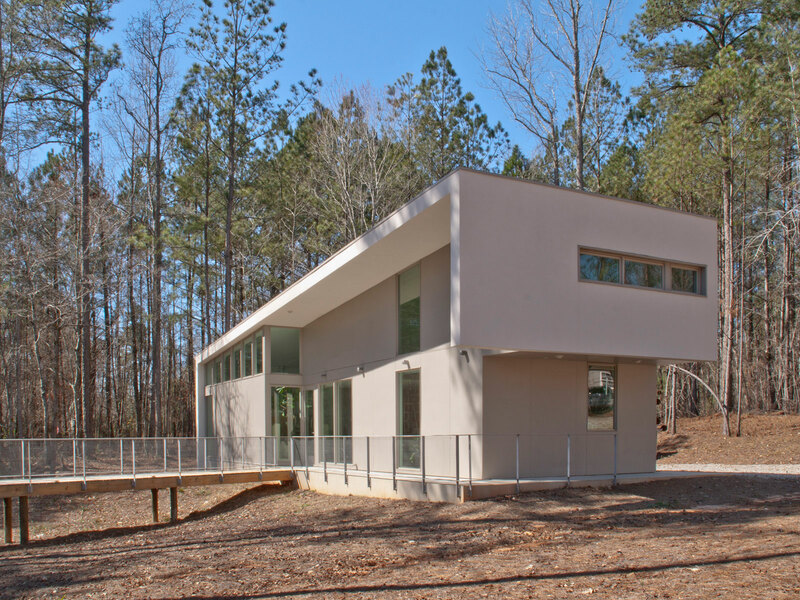 The Brenner Studio, a workspace and gallery for the encaustic artist Barbara Brenner, is adjacent to the artist’s home on a 3-acre lakefront property near Newnan, Georgia, 40 minutes south of downtown Atlanta and a short 5-minute drive from the conservation minded village, Serenbe . 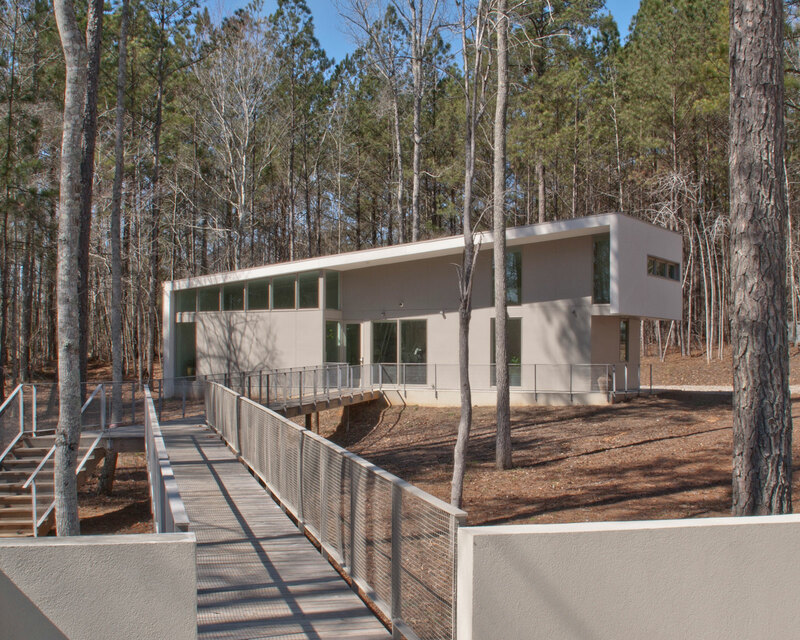 Designed and constructed in conjunction with the artist’s house, the Studio includes a workspace, conference area, gallery/living space and a sleeping loft for visiting artists and collaborators. The spaces are linearly arranged in a sloping loft-like space with the workspace at the low end and a 2nd floor sleeping loft at the high end. The conference and gallery spaces occupy the middle. A carport, extending from the side of the workspace, provides a covered service entrance and defines the main entry. On the opposite side, a doorway leads to an elevated boardwalk connecting the studio to the main house. The exterior follows the theme of the main house’s 2nd floor with a light colored stucco frame encapsulating dark gray in-fill panels. 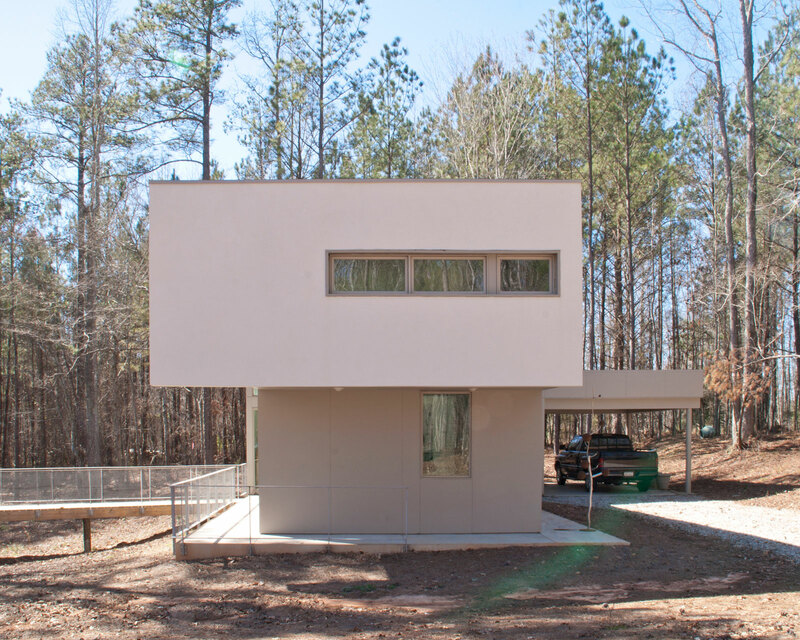 At the studio, the stucco frame begins as a wall touching the ground on the low side, continues up the sloped roof line and down the high side, stopping at the 2nd floor sleeping loft. Offset from the stucco frame, walls of gray fiber cement and glass panels articulate the design with ever-changing shade and shadow lines.